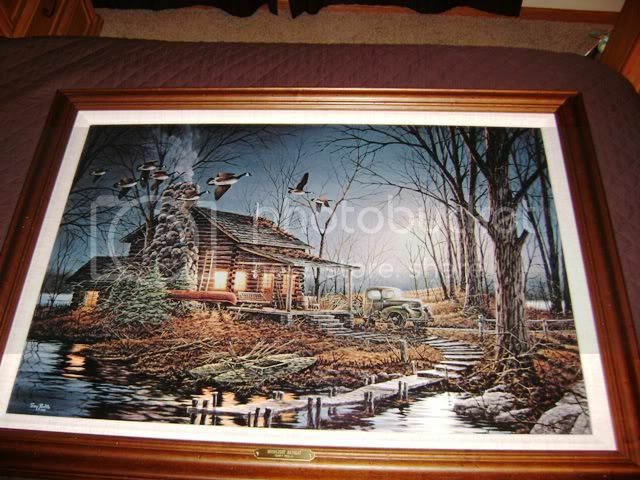 Whitetail World Forums » WTW Member Section » Classifieds » Terry Redlin Print for sale Select A Forum INFO ON NEW FORUM » Making the Move... It's All About The Whitetails » Whitetails "Catch All" » Got Pictures? Got Video? Got Questions? » Food Plots WTW Member Section » News and Notes » Introductions » Member Hunt Journals » Contests and Challenges » Classifieds » The Spot for Jokes and Games Some "Other" Stuff » Equipment / Gear / Reviews » Turkey Talk » Other Critters » FAQ's and "How To's"
I have a Terry Redlin canvas for sale. It is Moonlight Retreat. I bought it at a Ducks Unlimited event. It is certified number 2904/10000. It is a 24" X 36" Canvas. I am asking $300 for it. good deal for someone on here! !